What's going on at Easter? For those of you going home from University at Easter, do check out the times of services in your local Parishes and make yourselves known. 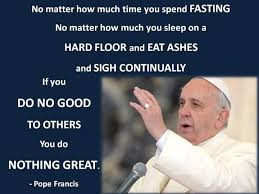 Don't forget what Pope Francis has said to all young people recently - Go and make a noise!! For those of you staying in Bath, there will be Holy Mass on Campus at various times - Please check here and on Facebook for times and days. There will be lots of services during Holy Week in Bath so do check out the websites of a Catholic church near you too. Father Bill OSM is the Parish Priest of Sts Peter & Paul in Combe Down and the times of Holy Mass there and all other services will be listed shortly... Come and say hello! !